Actors DeAnn deGruijter, Natalia Gracious, Jeff Ho and Noah Spitzer read Sprucecourt students’ plays during the Playwriting Festival at YPT. Throughout the past school year, grade 4/5 and 5/6 classes at Sprucecourt Public School – a YPT Member School – worked with professional playwright Paula Wing to create their own short plays. The sessions focused on various aspects of playwriting, and each workshop culminated in a related writing assignment given to the students to continue developing their writing skills before the next visit. In May, the students came to YPT and saw their plays come to life through staged readings directed by YPT Artistic Director Allen MacInnis and featuring professional actors. Classroom teacher Carolyn Ball, and playwright and project facilitator Paula Wing, sat down with YPT Member Schools Manager Aimee Bouchard to discuss the process of supporting the students as they developed their short plays. What was the incentive behind the Playwriting Festival? Carolyn: From the very beginning, the thought of collaborating with YPT and working to build our students’ skills to the point where they could participate in a Playwriting Festival was exciting for us (the teachers). Many of our students have had the opportunity to attend theatrical performances in that space for several years now. Knowing that their finished products were going to be performed on the YPT stage by talented, professional actors was a tremendous incentive for our students to work hard, take risks with their learning and be courageous enough to allow their natural creativity to emerge. Paula: The idea was to get the students turned on to the idea of creating their own work, their own characters, of connecting their experience to creative expression, and seeing what it takes to bring an idea to a fully-staged reading. Each session focused on one aspect of writing a play: Character, Conflict, Power & Emotion, Stakes, Motivation & Desire. The first session focused on writing characters – Paula, how do you begin to get students thinking in someone else’s shoes? Paula: I use various techniques, but a couple of favourites are visual images, taking a picture of a single person and asking students to imagine a whole life and most importantly, a dilemma for this person – character is revealed under pressure. They then explored the dilemma through writing a monologue. MAPLE: What type of Syrup are you? MAPLE: So we’re… Related? Nice. SALSA: Well, you guys are probably 10% cousins. A little bit of Syrup blood. SALSA: Sheesh, come off it Eggshell. Between the sessions, the students were asked to do some writing exercises to continue developing the areas of focus they were working on. Was there an exercise that the students found particularly engaging? Carolyn: Prior to the beginning of our work together, I had already completed a series of workshops with my kids that focused on writing from different points of view. They really enjoyed it and so it was a natural extension when Paula started speaking with them about monologues and in particular, the activity where she randomly gave each of the kids a different magazine picture to think deeply about and then write about what the person was thinking and experiencing. In fact, several of my kids continue to bring me pictures accompanied by a monologue, which also provides me a window into what they are thinking about on numerous levels. DAD: There is no bright side. We didn’t want you. DAD: We had to take you. Someone got Elizabeth first so we picked you because you were the only kid left. Many of the plays dealt with some pretty serious subject matter. How do you tap into young people’s understandings of conflict and imbalances of power, and how do you encourage them to write stories that are full of these dramatic elements, without hitting a nerve? Paula: I think this project provided the students with an opportunity to express things they know safely: fictionally. They can use their own experiences and understandings without having to reveal anything that might compromise them or anyone else. Through the fiction they can express – and possibly more deeply understand – situations that have been potentially difficult in their lives. Carolyn: It’s true, several of the plays were based on some fairly heavy topics. And yet, this is the world our kids live in. As their teachers, we did not influence their topics for the plays they wrote – it all came from them. Within the lives of students there are changing family structures, whether it be as a result of divorce, death, or a parent moving to another country to work and these are realities for kids today. Plus, a deeper awareness of the atrocities of Residential Schools through Gord Downie’s Secret Path is educating a new generation of students on some of the blemishes from Canada’s past. This has been a thought-provoking topic of conversation and reflection this year for our kids. They have a strong sense of what is right and a desire to correct the injustices in the world. I think what we are hearing in their plays is a reflection of how they are seeing the world. They are amazing and care deeply…we are in good hands with the next generation. SISTER MARY: …So what is your name? SISTER MARY: (Body language showing that she is frustrated and becoming angry) No, it is not! Your name is Elizabeth Anne. OOPIK: (Defiantly) That is not true! My name is Oopik Auski. Not Elizabeth Anne. I will never be Elizabeth Anne!!! SISTER MARY: We will see about that, young lady. Why don’t you see we are trying to help you? How do you teach young people about stakes in drama? Paula: We found a great way to connect them to the potentially tricky idea of stakes. We asked them to work with a fresh egg. They stood close together and passed it to each other. No problem = low stakes. They stepped further apart and passed it again. Slight potential for a problem = mild stakes. Then they step far apart and have to throw the egg to their partner. Potential for a problem = high stakes. As soon as we started tossing a raw egg around, they instinctively connected to the idea of stakes! 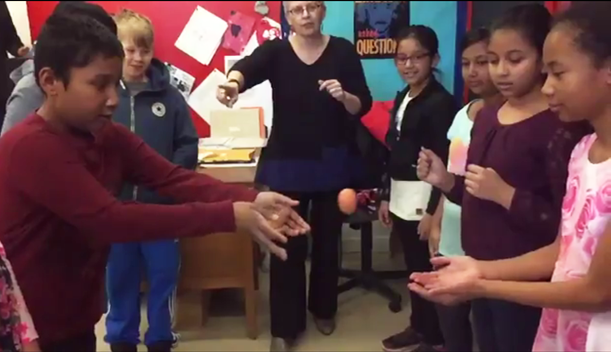 Paula facilitates one of her favourite activities to teach the students about stakes in drama. GEORGE: Did you notice the guy who pushed through the turnstiles when we were coming into the station? Well, the same guy sat across from us on the subway…and don’t look right now, but he is watching us from the picnic table behind us. BOB: No way, really? Who is that guy? I’ve never seen him before. DEVON: Me neither. I don’t know who he is…but I don’t like the idea he is watching us. The students were working in writing teams throughout the project. What did you notice about their collaboration with one another? Were there any challenges? How did you help them work through these roadblocks to create final drafts that everyone had contributed to and was happy with? Carolyn: I am really pleased with how well they managed and supported each other throughout the process. My kids are in the fifth grade and so we are constantly working on building skills that lead toward positive collaborative interactions. This project gave them first-hand experience with needing to compromise when working toward a finished product that reflects the thinking of ‘the team’ and not simply themselves or one other person. While the students were wonderfully successful in the end, this is not to say that there weren’t challenging moments. Thankfully, I have wonderful young people in my class who have worked hard to build a culture of openness and respect through ongoing conversation, and their commitment to these principles helped them navigate the impasses that were naturally part of this process. Paula: Based on their feedback, they loved developing their plays in groups, they enjoyed having time to brainstorm and to co-write. It took the pressure off them individually and everyone felt themselves represented in the final play, even those who joined the group late and were only participating in the second and third drafts. I credit the teachers, who created the groups and who watched over their progress with such brilliant attentiveness and guidance. I felt these classes very quickly put their egos to the side – more quickly than I would have thought possible. They understood that they were working on something bigger than each individual. When we had to select some plays to go forward and others to be let go, I think they were very challenged by that, but again, with the teachers’ help, they moved on relatively quickly. COLE: Stay one more day and then the sun will rise in the east and then you can at least know where you’re going. KAI: Hajj starts tomorrow! We have to go now! I spent 15,000 dollars on this trip! COLE: Is your life more important or is the money more important? KAI: Neither. Religion is most important. COLE: How can you have a religion if you don’t have a life? KAI: At least I’m trying. Was there anything you noticed about the students’ writing by the end of the project? Paula: They created great dialogue. They were able to inject humour even into the most serious situations they had created. They gained confidence in their choices, in their artistic vision for their pieces. Carolyn: The first thing that comes to my mind is how this journey has boosted their self-confidence. What an accomplishment to see their work performed by talented actors on such a respected Toronto stage. This project provided my students with authentic writing opportunities and there really is nothing more valuable than having students write for a purpose! Combine that with being able to see their work come to fruition on the YPT stage and it quickly becomes one of the most memorable moments of my teaching career and without question, their academic careers to date. See Part Two of this series to learn more about the festival day from Natalia. YPT’s Member Schools program aims to create a deeper relationship between participating schools and the theatre. YPT works with school leadership to create a three-year partnership specifically tailored to the aims and needs of that particular school. Each partnership is different but all include increased attendance at the theatre, enrichment for students and teachers, as well as research with and by the participating school’s students and staff. It provides many opportunities for innovative learning experiences behind-the-scenes.